My name is Kevina-Jo Smith; I am an artist who makes things from upcycled and collected materials with the aim of creating awareness of environmental issues. I really enjoy creating large immersive exhibitions and installations made up of smaller works. I enjoy creating a 'world' for the viewer to experience being in, to promote thoughtful change and awareness. What do the Blue Mountains mean to you? The Blue Mountains is currently home; it is somewhere to come and go from regularly, it is a giver and taker of energy, it is fresh air, it is beautiful, it is community, and it is a place where I have found many types of creative people I am grateful to have in my life. Who is your maker of the minute? That is such a hard question; I can never pick one! I enjoy Susanna Bauer's work. My work is so 'messy', complicated, and overly colourful and textural because of the materials, so I fantasise about simplicity and Susanna’s work is so beautifully simple and peaceful but it is also really complex and skilful. Kevina-Jo Smith’s immersive exhibition is in the Window Gallery and Atelier of Lyttleton Stores Cooperative throughout March (closes 3rd April), 2019. All works are for sale, and there is a free work, too! Wild Wattle is sisters Lisa and Anita of Wild Wattle. At the moment, Lisa is on maternity leave, and I (Anita) along with some studio help am making ceramic beads & bud vases, carved recycled timber bud vases, recycled sterling silver and solid brass jewellery and biodegradable and recycled fabric jewellery (most of which are designed by Lisa). I love mixing it up! The processes for each material we use are completely different, so they all require a different headspace and a different type of inspiration/motivation. That means there’s always something I’m itching to dive in to - whether getting my hands dirty in clay and making natural forms with my palms, or the more logical/straightforward process of cutting lengths of sterling silver wire to solder in to our predetermined shapes, or putting different colour combinations together using our biodegradable pigments; I love different things at different moments in life! Home, offering, and abundance. We both grew up in Springwood, and loved walking down the fire trail at the end of our street looking for what little blooms were in season to press in a flower press, or place in tiny little vases. Now, as and adult, I find myself needing to choose to call the Mountains home, which brings a whole new sense of belonging, and a responsibility to steward it well, and share it with visitors and newcomers. Who’s your maker of the minute? Always God! Any human maker I admire is usually making things that draw out certain aspects of God’s creation - whether colour, shape or texture. I love when people hone in on one of these aspects and create a collection that makes you appreciate nature in a whole new way - particularly at the moment, loving the curated colours of Bobby Clark. Branching Out Designs is a collaboration of sisters, Jillian Culey and Carolyn Dance. We make woven baskets, bags and sculptures from natural fibres that we harvest and prepare ourselves. Our woven pieces are created using the techniques of string making, twining, plaiting, randing, random weaving and rib construction. There is no particular style or material that we enjoy making the most. One of the beauties of basket making is the wide range of possibilities. By changing the materials and/or techniques you can greatly change the finish product. Our homes and studio are nestled on a bush block in the Blue Mountains. The surrounding flora and fauna inspires and informs our creative practice. Many of the materials we use we harvest within walking distance of the studio. There are so many basket makers and artists that we admire. Some of which include Jennifer Zurich, Kentucky USA, Tim Johnson, UK, Mary Butcher, UK and the Arnhem Weavers, Mapuru NT. I’m Ainsley of A+ Co, and I’m based in the Megalong Valley. I make everyday textile products using vintage and recycled fabrics like linen and cottons. Such fabrics are strong and durable enough to be made into my products- dish cloths and market bags. Everything is made by myself on my vintage industrial sewing machine. I most enjoy making the dishcloths out of different textiles; it’s enjoyable to wash the dishes if you have nice products! I also love sourcing my fabrics. The Blue Mountains was a new beginning for me and the inspiration behind my creativity. It’s a very special and unique place. I adore Pip Lincolne; she’s all things crafty! A + Co’s handmade dishcloths and market bags are available in Atelier of Lyttleton Stores Cooperative, Lawson. 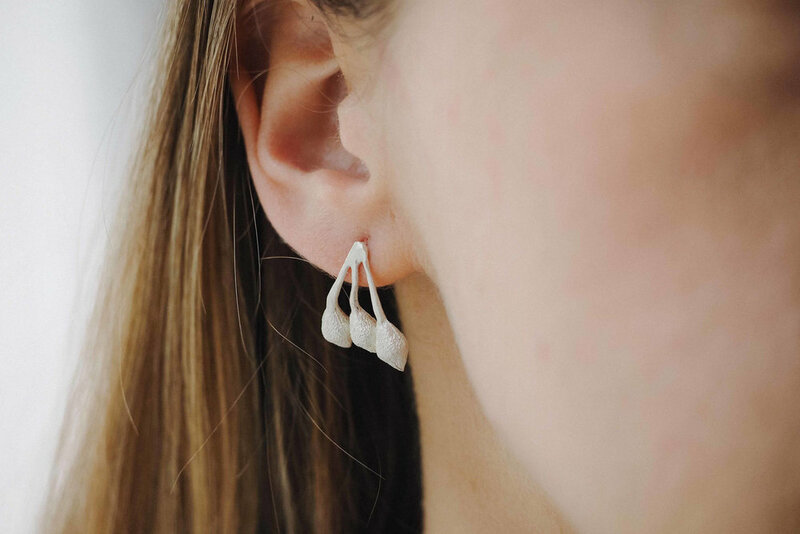 I’m Cath of Studio C, a maker of tiny pots and wearable pieces of porcelain jewellery. The moment I started working with this beautiful earthy medium I was hooked. After many years creating and experimenting it’s such a privilege to be actually selling now. I enjoy the wonderful tactile nature of the process. I enjoy taking each piece through the rather slow, methodical processes of shaping, imprinting, sanding, colouring, glazing and firing. Each step is absorbing, calming and sometimes unpredictable though always joyful. The Blue Mountains is my birthplace. I grew up here into my teens and, after years working abroad, returned with a family to raise. The Mountains gets into your blood; you can’t beat the bush, the mist, the air and the p(e)ace. It’s a special place. As a passionate lover and supporter of the handmade this is a hard question to answer. One art form I really admire is screen printing on linens; I just love the beautiful work of Promenade Design and Laughing Bird Studio. Studio C’s pots and jewellery are available in Atelier of Lyttleton Stores Cooperative, Laswon. I am Greg Crowe and I recently moved to Sydney from Perth. I have been potting and teaching pottery for over 40 years. Without a doubt if I could only make one style of pot it would be bowls, simply functional or simply decorative, with a presence of their own. I have always visited the Blue Mountains when in Sydney. I think they are a calm oasis for Sydney with spectacular scenery and an incredible feeling of the unknown. Who’s you’re maker of the minute? There are many potters that I admire, some I have worked with in the past, such as Svend Bayer, Devon, UK, Jeff Oestreich, Minnesota, US and Gwyn Hanssen Piggot , Australia. Also Micheal Simon, US and Richard Batterham, UK who I have not worked with. My taste is fairly eclectic, but usually around thrown pots. Greg Crowe’s ceramics are available at Lyttleton Stores Cooperative, Lawson. My name is Trish and I have been making since my mother taught me to knit when I was about 5 years old. I will try my hand at anything but love sewing clothes and knitting. I enjoy making things that use natural fibres or that use upcycled and recycled fabrics. A number of the children’s clothes that I make are made using fabrics that are no longer wanted by other makers or that started out with a different life. The produce bags that are currently for sale at Atelier are made using bolt end fabric. This stops a little going into land fill and by using them we all help to keep some plastic out of use. I am currently working on some shopping bags and other household bits that would also lessen our impact on the environment. We only moved to the Blue Mountains in January 2017 but it feels like being home after many years of moving around! It did from the moment we arrived at the front gate on our first viewing of the house. I believe that I live in the most beautiful place on earth with views that are sublime. And now I am building the garden that I have always wanted. Living here has opened a new palette for my work and the mists in particular inspire me. I am in awe of Katwise! Or Kat O’Sullivan, who upcycles woollen op shop finds into the most amazing sweaters and coats. Her approach to her making and life is just a joyous journey. Patricia SwiftHunter's produce bags are available at Lyttleton Stores Cooperative, Lawson and Trish’s knitwear was also available at our Wintertide Makers Market on the 22nd of July 2018. Ian: We are Ian and Robyn, friends who work together to make WYCK candles. We hand make everything. We blend the oils, and hand pour, wick and label each candle; we even individually fold each votive box. Ian: I've got a logical, analytical sort of mind, which is important when the process of making candles requires (at times) adherence to process. But it also allows imagination - in creating the fragrances, in selecting papers, in making boxes. Every time I finish a candle or a box of votives, I still look at it and think "that's beautiful, and I made it". It's also nice after spending a day pouring to have people tell me how pretty I smell! Robyn: To me, there are three parts that give me the most joy. The first is taking a candle out of its mould, smelling the scent as it is first released and seeing how the texture in the wax has appeared on each candle differently. The second is the creative side of playing with scent combinations – how much of this against how much of that – until you have the balance just right. The third is when we have direct contact with a customer who has enjoyed a Wyck candle – it makes my heart smile to know that people are enjoying our creations. Ian: The Blue Mountains is something of a sanctuary. If I'm ever away, even just down in Sydney for the day, there's a sense of calm and relief when I return. It's both the feeling of community and the sheer beauty that surrounds us. It's home - and I consider myself lucky every single day. Ian: That's a really difficult question - the diversity of the creativity makes it really hard to single out just one maker. If I were to pick one, it would probably be Steve Sheridan and the delicacy of the beauty found in his ceramics. Robyn: For me, the answer is Freedom Wilson of Laughing Bird. Her artistic style is beautiful and speaks of the Blue Mountains and Australia. I love her Lyrebird; always have, always will. 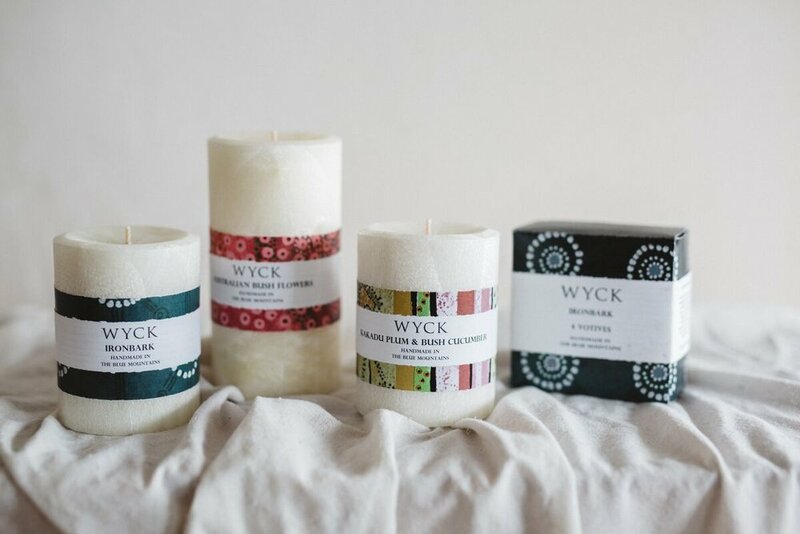 Wyck's Australian bush-scented 50 hour and 75 hour pillar candles and sets of four votive candles are available in Atelier of Lyttleton Stores Cooperative, Lawson. I am Tania Bowers of Wild Botanik. I make textiles and objects based on botanicals I grow or forage and collect. I also keep vintage objects to include in my accessories and artworks. It changes constantly. I'm not much of a production-line person. Some weeks I'm all about eco-dyeing textiles, the next I'm back to leather work or hand stitching. I guess the answer is change; I enjoy making change the most! The Blue Mountains means home and where a new chapter of my life began. It means fresh air and more freedom, more space and peace than I've ever had before. I've been looking at quilts again, so definitely the Women of Gee's bend. Communities that make together are my biggest inspiration right now. Wild Botanik's eco-dyed ribbon, scarves and cushions are available in Atelier of Lyttleton Stores Cooperative, Lawson. My name is Rob Baigent. I have lived in the mountains for 10 years, but have had some association with the area for more than 40. Whilst growing up in Tasmania I developed an appreciation of the beauty and joys of timbers such as Blackwood, Huon pine, Sassafras, and Celerytop pine. Most of my work is turned wood, particularly smaller items which can be salvaged from discarded or ‘waste’ material. I also make small items of furniture. My wood turning started about 30 years ago, but I have been doing other woodwork most of my life. The more intricate things like turned boxes are my favourites, particularly when combined with some embellishment like carved handles or a little added colour. My greatest pleasure comes from finding the beauty in a discarded piece of timber. The Blue Mountains World Heritage Area is a magnificent example of why it is essential to preserve as much of our natural environment as possible – it is such a beautiful and interesting place to live and walk. The wonderful natural environment obviously attracts many very talented people. This combination of environment and talented people makes it really special. This is difficult; there are so many amazing people working with wood in Australia. At the moment I will nominate Neil Turner in West Australia as my favourite. His beautiful, intricate carving of turned objects is inspiring. Rob Baigent’s wood-turned bowls, vases and ornaments are exclusively available in Atelier of Lyttleton Stores Cooperative, Lawson. My name's Miranda Earle. I love pattern and colour and I’ve been printing my designs onto fabric for many enjoyable years. I'm inspired by the form and geometry of nature. I love the process of carving my own lino blocks and the repetition of printing lengths of fabric. 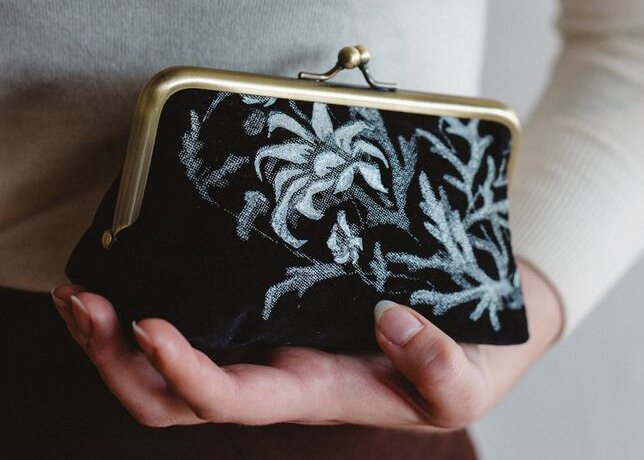 My designs and hand printed fabrics can be found on handmade purses, scarves as clothing. It's all about the fabric. I like transforming my sketches into designs that work on blocks and stencils. The process itself is so enjoyable and exciting. I never get tired of it. The Blue Mountains represent not only an incredible community of talented and innovative creatives, but also the endless inspiration that I find in nature. We are so privileged to have it on our doorstep here! It’s so hard to choose just one! I'm so privileged to be surrounded by so many wonderful makers and creatives. I'm going to say the label High Tea With Mrs Woo. Miranda Earle’s firewheel tree, flannel flower and wattle purses are exclusively available in Atelier of Lyttleton Stores Cooperative, Lawson. I am Edith Rewa, or Edie! I trained in textile design (screen printing) but I mostly make pennies from plant-based illustrative work now. 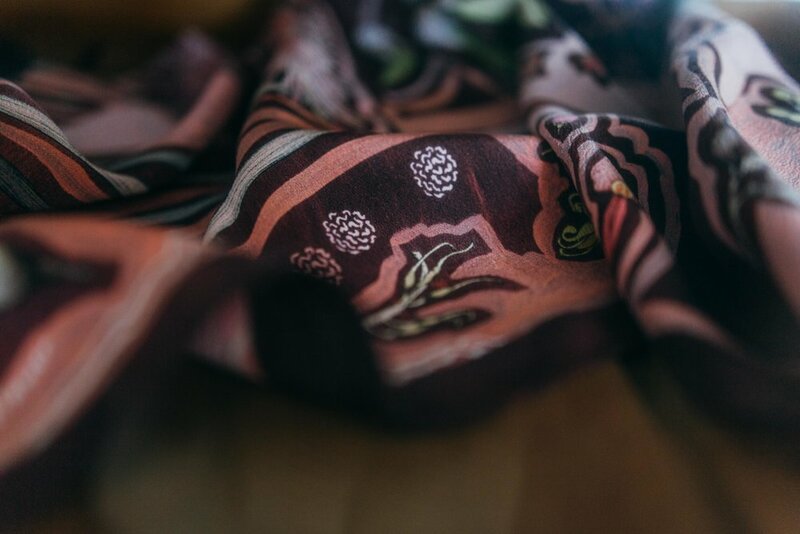 I design illustrated silk headscarves, which showcase Australia's native flora and fauna. I also have a range of art prints, gift cards and a small run of clothing in the works. When I'm not working on my product range I'm doing client-based illustration and pattern work. Nothing beats sitting out on the heathland behind where I live, looking out over the Kanimbla Valley, tucked in between leptospermum, casuarina, mallee and banksias with styphelia nipping at my ankles. It’s these sorts of immersive hours spent drawing in the bush that give me the most joy. I recently had a small exhibition, 'Plant Portraits, Blackheath' which was a culmination of time spent in the Blackheath landscape doing just this! For me the Mountains have been a place of great learning, where I have had space to stretch my legs and have a wonderfully indulgent work life! Edith Rewa’s scarves and cards are available in Atelier of Lyttleton Stores Cooperative, Lawson.